Grab some tips for invisible braces and its cost! Are you one of the many people choosing to wear invisible braces for straightening your smile? Invisible braces are a popular modern way to rearrange misaligned and crooked teeth. Although this modern choice alternative to traditional braces seems like a miracle solution, like any other process, it takes times to be accustomed to. Understanding the process and dedicating yourself will help you achieve the results you are looking for. How do invisible braces Melbourne work? Invisible braces are a series of plastic, clear, custom-made trays that should be worn by patients over their teeth for at least 20 to 22 hours a day. They are entirely removable and can be removed while you are eating and taking care of your oral hygiene. Each set of trays are designed to exert gentle pressure on the teeth in order to rearrange their positions. Each tray is designed to move teeth at different stages. As teeth moves, you should replace the tray with a new one, every two to three weeks until the treatment is complete. How many hours a day should I wear invisible braces? As discussed, invisible braces should be worn almost all day long 20 to 22 hours a day. The trays should be changed every two to three weeks to accommodate teeth moments which depend on the complexity of the treatment. Your dentist will evaluate the complexity of the procedure and wearing time as the treatment progresses. The invisible braces cost Melbourne is very affordable. However, you will be shortchanging yourself in terms of money and time if you neglect to understand the importance of wearing time. How to take care of invisible braces Melbourne? 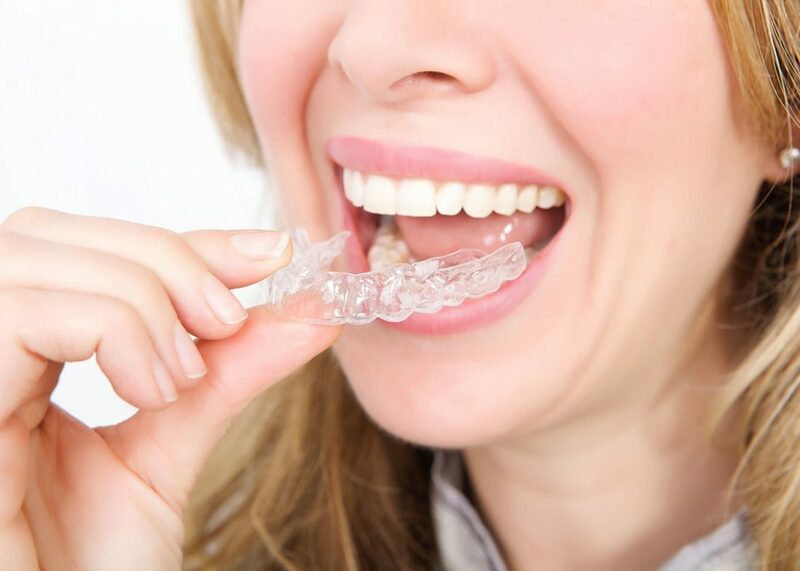 For the health of your gums, teeth and other parts of your mouth, you should clean your aligners throughout the day, particularly after every meal. This is an essential part of the treatment. If you leave your braces unclean, there are chances your teeth may be affected by bacteria and plaque accumulation between the teeth and the braces ending with decayed teeth. When you opt to get great looking teeth, you are making an investment in money, time and most importantly your appearance and the health of your teeth. Your journey with invisible braces requires a level of commitment not only to the process of wearing it but also for caring for your trays. Besides, you should also be diligent to your oral hygiene. Another instruction is to remove your whitening trays while you eat, then clean your mouth before placing them back on again. This is to prevent food debris and plaque getting accumulated between your teeth and the braces resulting in cavities. Invisible braces treatment is highly affordable. Unlike traditional braces, cheap invisible braces help you to flaunt a bright smile without getting all the wires and brackets on your mouth. The cheap invisible braces Melbourne gives long-term results they give you. Get your invisible braces now to enjoy a healthy smile! Are you worried about your misaligned teeth and hiding the smile because you would rather not be seen with metal wires and brackets? Why not choose invisible braces? Traditional metal braces can take a long period to successfully straighten your teeth while you are dealing with other discomforts like eating restrictions, the endless struggle of brushing and flossing around the wires, and the embarrassment of smiling with those unsightly metal wires. You can now straighten your teeth and smile using nearly invisible aligners that allows you to avoid metal wires and brackets. What is the difference between metal braces and invisible braces? Both braces and clear aligners are designed to straighten your smile. So what makes them different? One of the significant differences between both the options is that the way they straighten your teeth. For decades, metal braces were the only option to straighten the misaligned teeth. From day one of your treatment, metal brackets are glued to the enamel of each tooth. Wires are then connected between the brackets to help gradually shift the position of the teeth. The duration of the treatment depends on the complexity of an individual’s case. Clear aligners use aligner trays made of BPA free plastic to shift the teeth slowly. Based on the depth of correction, you will be given several sets of aligners. They are customised according to the patient’s goals. Why are invisible braces in Melbourne a great option? Invisible braces are completely invisible. Yes, the clear aligners cannot be noticed by others unless you reveal them. The invisible braces cost in Melbourne is reasonable, and they use see-through custom fitting dental trays that slip on over your teeth and gradually make the teeth shift to achieve the desired smile. Most people won’t even notice it; they are nearly invisible! Unlike traditional metal braces, cheap invisible braces in Melbourne are removable. 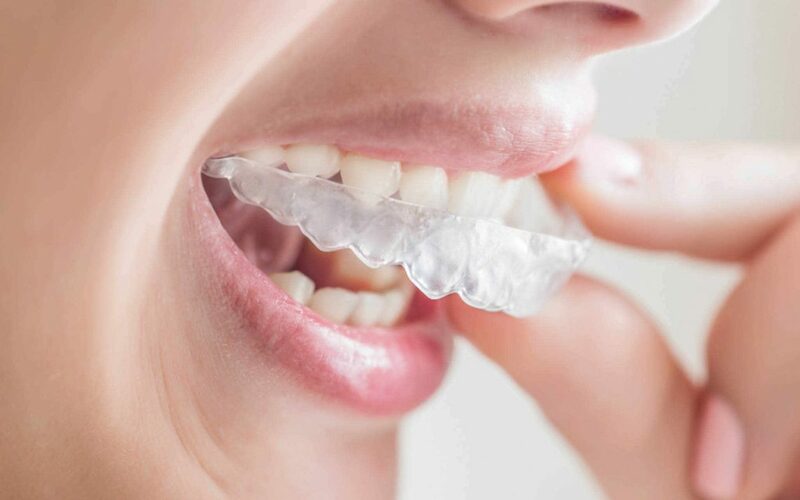 No ma tter if you are getting married or having a photo shoot or an interview, clear aligners use removable trays that can be removed whenever you need them. Yes, you can get that picture perfect smile and enjoy your favourite foods. Cleaning and flossing with metal wires is a tedious process, and it can be overwhelming. As clear aligners are removable, it allows you to brush and floss your teeth normally. You don’t have to spend on special brushes and flossing tools to clean the braces. It helps save time and money on additional accessories to clean your teeth. When compared to traditional metal braces, invisible braces give you maximum comfort. Those who wear metal braces often end up with scars on the insides of their cheeks from sharp wires. Smooth clear aligners do not cause any damages to the soft tissues in your mouth. With invisible braces, you may need only fewer appointments, and you can straighten your teeth soon. During the visit, the dentist will examine the results of the teeth and suggest a different set of aligners to achieve the desired results. Reasons why you should get invisible braces instead of Traditional Braces! Are you considering to straighten your smile? Are you confused whether to get wired braces or go for invisible braces? Which one is more preferable? Which one is more effective? These are the questions that normally come to our mind whenever we go to a dentist. For many years there was no alternative to wired and bracket braces. Thankfully that era has gone long behind, and now invisible braces Melbourne are the new wave. They come with many benefits that you should know before committing to getting one for you. With the rapidly gaining popularity, we can assure that they will eventually leave traditional braces as an option in the past. Here are some of the good reasons to choose invisible braces instead of traditional ones. What are Invisible Braces? How do they Work? Invisible braces are nothing but a series of clear aligning trays that help to move your teeth slowly together. Each tray will move your teeth a little. All you should do is to wear them regularly for about two weeks and then move on to the next tray. These affordable invisible braces cost Melbourne are designed in such a way that each tray tightens your teeth a little more than the previous one just like traditional braces. The difference between the traditional braces and invisible braces is that the traditional ones do not require switch off trays, but you should visit your dentist periodically who will tighten your braces with a new wire. Why are Invisible Braces Melbourne better than Traditional Wired Braces? 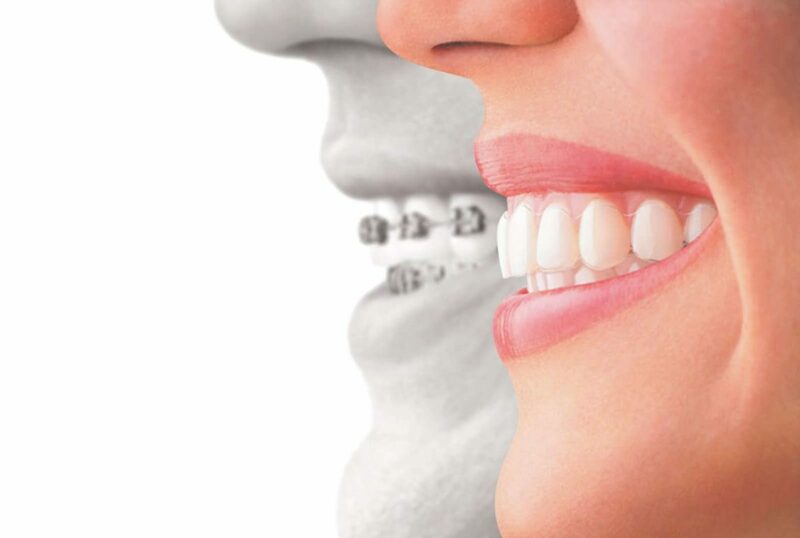 With wired braces fitted in your mouth, it becomes difficult to give your teeth a good clean. Food may stuck in the hard-to-reach areas, and this trapped piece of food may lead to poor dental hygiene or tooth decay when not taken care off. With invisible braces, they are easy to pop out and clean. You do not have to worry about brushing and flossing between brackets and wires with invisible braces you can simply remove and clean them on a regular basis. 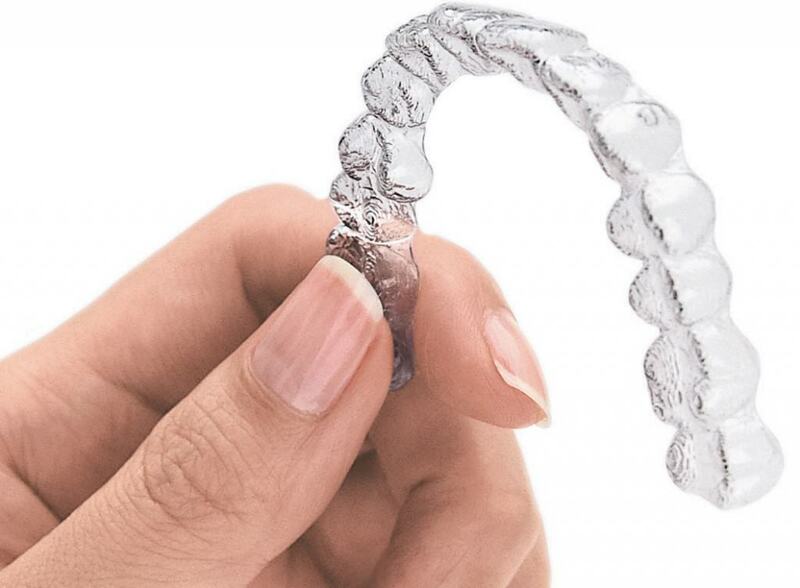 Although these new pairs of trays may take some time for you to feel used to it, the invisible braces are said to be more comfortable than traditional ones by the patients who enjoy their benefits. These braces have no sharp edges from brackets which may irritate your cheek. It also requires no regular visit to your dentist to tighten your braces. You will be given a set of aligners that you can change once in two weeks. Also according to patients, there is only a minor tightness that will not last for more than two days after you put in a new set of aligners. Certainly, one of the biggest advantages the invisible brasses gives! With traditional braces on, you will have a lot of restrictions with food which your dentist will suggest. Yes, chewing gums and hard foods may damage the wires and brackets. However with dental implants, as discussed already, they are removable so you can remove them while you want to treat your taste buds. These are just some of the benefits the cheap invisible braces Melbourne offers. Have one now to enjoy more! Not everyone is lucky enough to have a perfectly straight set of teeth. If you do, you are blessed! However, if you are like the millions of people who are suffering from crooked or misaligned teeth, we are here to help you. Have your crooked teeth kept you from smiling with confidence? Are you concerned about your smile? There are a lot of reasons for one to want a picture perfect smile! Nowadays there are a lot of options to get the smile we had been always dreaming of. But thinking of braces, the metals and criss-cross wires around the mouth that are totally unappealing is the first thing that will come in our mind. But invisible braces Melbourne is one of the best options people choose nowadays. Let us discuss more on it! What are Cheap Invisible Braces Melbourne? Invisible braces are clear and removable aligner trays which look like your teeth. These whitening trays are customised to fit one’s smile. What does the Invisible Braces Process look like? First, your dentist will take x-rays and impressions of your teeth to create 3d images. With these images, he will try to create a unique treatment plan to fix the alignment of your teeth. These clear aligners are designed based on the customised plan designed for particular patients. Your dentist will also predict you for how long you will have to wear those aligners. Also, each set of trays at each stage focuses only on a specific set of teeth pushing them to come to the proper position. What are the Benefits of Invisible Braces Melbourne? Though there are a lot of benefits associated with invisible braces, one obvious advantage of choosing it is that they are virtually invisible. This means, no one, even your friends who meet you regularly will not find you wearing them. Also, because they are custom made for your smile, you will enjoy a comfortable fit that will not interrupt your speech or bother your gums or cheeks, unlike traditional braces. The invisible braces are removable so that you can remove them while eating and cleaning. This means you can eat any of your favourite food without worrying about the braces in your mouth. Also, you can clean the braces thoroughly after every meal helping prevent any bacterial build-up, and also avoid unpleasant smell from your mouth that is one of the most reported problems with the traditional braces. To get the precise answer for this question, it is best to visit your dentist for a check-up. He will examine your teeth condition and suggest you with one. However, invisible braces are an excellent choice for anyone because they can be customised to your unique needs. The invisible braces being one of the most suggested treatments nowadays are claimed to help retain the dream smile of people at any age. So, it’s never too late to have the smile you have always dreamt of. Visit your dentist now and get your affordable invisible braces cost Melbourne now! What Are All The Benefits Of Wearing Invisible Braces? “Let us be grateful to the people who make us happy; they are the charming gardeners who make our souls blossom”! Invisible braces have modernised the process of straightening the misaligned teeth. Formerly, Traditional metal braces were the only feasible solution for the teeth misalignment. But today, Invisible braces offer comfy and allow patients to get them without difficulty. Crooked or crowded teeth can be a significant problem for anyone irrespective of age. Even though you maintain good oral hygiene, it won’t stop people from making negative judgements about your crooked teeth. Getting invisible braces are the best and permanent solution to this problem! Here are some tips to know about the Invisible braces in Melbourne! What Do You Mean By Invisible Braces? They are the pair of aligner trays, made of smooth and comfortable material. They gently shift your teeth to make the perfect alignment. They don’t require any metal wiring to tighten. The Invisible braces cost in Melbourne is more affordable, and by acquiring them, you could attain a beautiful smile! They are smooth and made of harmless materials which won’t irritate your cheeks and gums like the traditional metal braces. You can wear them throughout the day, and remove them during eating and cleaning. 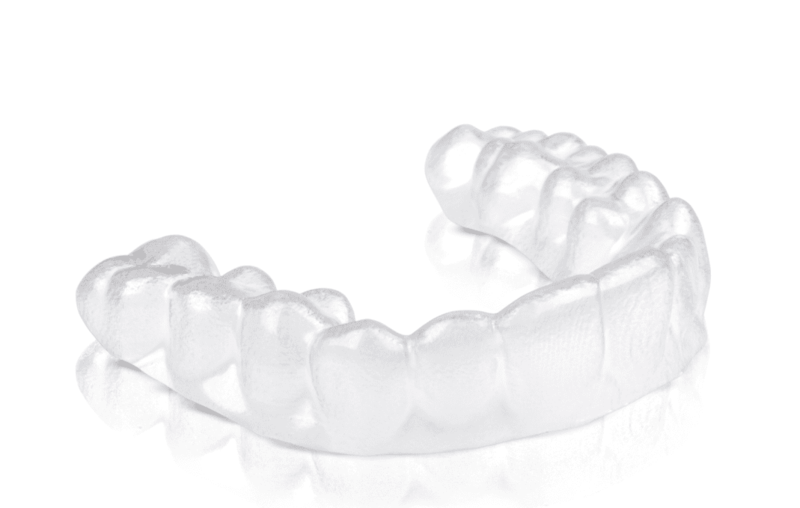 This pair of aligners gently shifts the teeth to form a perfect alignment. One of the interesting facts about these braces is that they are virtually invisible. Thus, people won’t notice that you’re wearing dental braces. Invisible braces are an appealing alternative to the traditional metal braces. They straighten your teeth gently and effectively. When you wear traditional metal braces, you can’t enjoy the crunchy and chewy foods since they may stick to the metal wires, making them harder to clean. But, when you prefer Invisible braces in Melbourne, you can remove them while eating, and enjoy your favourite foodstuffs! Perfectly aligned teeth not only enhance your appearance but also boost up your confidence. A straight, clean and clear set of teeth expresses that, you care more about your health and personality. Straight teeth can be cleaned easily, and they don’t trap as much bacteria as crooked teeth do. With traditional metal braces, it’s really hard to clean all areas of your mouth. This may lead to the formation of cavities. Straightening your teeth with the help of invisible braces eases the cleaning process which contributes to a healthier smile! The typical treatment time of Traditional metal Braces is an average of two years. It may vary depending on the severity of the misalignment whereas the treatment time for invisible braces lies between ten to twelve months. When you are in the phase of straightening the teeth, consider the affordable cost of invisible braces in Melbourne! An attractive smile makes your first impression into the best impression. Research says one-third of the people you meet will first notice your teeth than any other part of your face. So beautiful smile is the most impressive feature that you should need while you meet someone. Also, a recent study shows, about 42% of the population wishes to change their smile into the brightest one, but don’t know where to go. Are you one among them? Say thanks to the modern dentistry and take a step forward towards dental clinic to shine your teeth! As a boon, modern dentistry has invented invisible braces in Melbourne, which helps you to get the brighten smile. Here let’s see some informative news on invisible braces. A most familiar problem people face on teeth is crooked teeth; it defeats the smile and beauty of the people. But by having invisible braces after discussing the cost of invisible braces in Melbourne, you not only get the aligned teeth but also it improves your oral health. Only an invisible brace can straighten your crooked teeth without altering its natural look. So give first preference to invisible braces over classic braces. How Invisible Braces Help In Oral Health? Here are the benefits of having invisible braces for your bucked teeth. Levelled alignment tooth is easy to brush and floss than the bucked teeth. With a straight tooth, you can block the bacteria that come from the food particles which get deposited between your teeth gap. Straightened teeth can help in efficient chewing and grinding, which helps in maintaining a healthy jaw. When You Will in Need Of Invisible Braces? Shortly, it corrects all types of teeth and leads you to get the name of smile beauty. Less duration of treatment, which means it takes just 15 months to get a new look. Invisible braces don’t spoil your appearance as classic braces do. Even people won’t find that you were on treatment. With invisible braces, you don’t feel irritation on your gum. Invisible Braces are easy to remove. We can clean and floss your teeth so that your oral health will be maintained. You can eat or drink anything comfortably. No need to afraid of food particles which get deposited in your teeth. There are several benefits of having invisible braces over classic braces, so it’s a better choice to choose invisible braces to straighten your teeth without any issues. If you are worried about the invisible braces cost in Melbourne, don’t panic, do more research and find the specialists, who offer more payment plans and affordable treatment with no compromise in quality. Invisible Braces – What Are They? Invisible braces impart patients with a perfect teeth straightening experience. High quality invisible braces are made using medically approved and comfortable materials that are customised to fit your teeth. As the name suggests, invisible braces are virtually invisible and can prevent so much of the problems that are created by traditional metal braces. How Does the Straightening Process happen? When your experienced orthodontist recognises that invisible braces are an ideal treatment option for you, they’ll assess your condition and offer you a customised set of clear braces for the treatment process. When the aligners are ready, you will have to use them for a few weeks. You will also have to obtain updated aligners every six to eight weeks, throughout the course of the treatment. Who can have Invisible Braces? Invisible braces are ideal to use for both adults and children alike. These braces are suited for those with issues such as narrow jaws, crooked teeth or similar issues mentioned above. What will be the length of the Treatment? Invisible braces procedure is customised for each patient depending upon their condition, which means the timespan of treatment can vary from person to person. The teeth straightening process can happen anywhere between 6 to 18 months, and perhaps, difficult conditions can take much longer. Nevertheless, each aligner will have to be used for about two weeks. Make sure you have no cavities or other issues. If there are cavities, get them resolved at the earliest. Invisible braces have to be used for nearly 22 hours. The freedom to remove them and to place them back at any time makes it a better option than traditional braces. Removed the aligners before you eat or drink anything. There are no dietary restrictions when you use invisible braces. Even after your teeth is straightened, you’d still have to use it to keep your teeth straight. Don’t forget to see if you are a good candidate for invisible braces. If not, your orthodontist will determine ways with which your candidacy for the treatment is improved. Ready to show off your perfect smile? Get in touch with your orthodontist today and opt for high quality invisible braces in Melbourne. Invisible Braces helps you to gain a beautiful and confident smile, and they are one of the best alternatives to traditional metal braces, ceramic brackets, and wires. The main advantage of using invisible braces is the people around you can’t identify your braces, but in the case of traditional metal braces, it can be identified. Wearing invisible brace can help you to speak and smile confidently in any social gatherings but traditional metal braces can’t. Here a list of common myths about invisible braces is mentioned below. Fact: Invisible brace treatment is not expensive. Instead, the severity or complexity of your orthodontic problems affects the cost of invisible braces in Melbourne. Also, the time taken for the treatment can influence the invisible braces cost in Melbourne. When compared, the cost of both traditional braces and the invisible brace treatment are the same. Fact: Invisible braces works well similar to the traditional braces for simple orthodontic problems. Depending on the severity of the orthodontic problem, the treatment duration varies. The duration of the treatment increases with the increase in the severity of the problem. Fact: In general, invisible braces take lesser time to solve your dental problem. It may take two years to straighten your teeth with traditional, but the invisible brace is capable of straightening the same condition in 6 to 18 months. Fact: In this modern world, many adults are undergoing invisible brace treatment in Melbourne and gaining positive results. Even though the invisible braces suits best for kids, with the help of the latest technologies and availability of invisible braces, it is quite easy for an adult to wear invisible braces without any compromise. Invisible braces can help you to correct the bite problems that affect your jaw joints, prepare sites for implant treatment, correct the tilted teeth to improve the quality of restorations, etc. Fact: Invisible braces help to rearrange your teeth in a better position that could enhance the functional ability of your teeth, and increases their life by improving your oral health. Since the Science of orthodontics is based on the natural tendency of teeth to shift throughout life, invisible braces will not weaken your teeth; instead, it will strengthen your teeth. Fact: You need to take more care of your invisible braces since regular intake of coffee, tea or red wines can stain your braces. So after each meal, you must clean your braces to maintain its quality and transparency. Invisible braces, as the name suggests, are clear braces that aren’t immediately visible unlike traditional metal braces. They ensure long term results, and one of the biggest perks of these braces is that they are barely noticeable to people. These user friendly braces can fix crowded teeth, gaps on your teeth as well as straighten your misaligned teeth. As mentioned earlier, invisible braces are invisible. They can be removed anytime and are much easier to clean and maintain as well. What’s more? Unlike conventional braces, invisible braces give you the freedom to eat and drink whatever you want. They can take out the braces, eat and drink and subsequently place them back themselves. Hence, this wouldn’t interfere with your day-to-day activities. Invisible braces are relatively priced more than conventional braces, but that doesn’t mean they are too expensive to afford. The technology behind invisible braces is innovative and it’s a really worthy investment, considering the long term results, ease of usage and lesser maintenance costs it offers. Who is not a good candidate for invisible braces? The treatment would require a patient to be 100% compatible, in such a way that they shall be able to wear it for at least 22 hours, and it must be kept safe by the user. Those who fail to follow these aren’t considered good candidates of implants. What Factors are considered for the Price? Time: The duration of the treatment. This further depends on the severity of the condition. Materials: The high quality materials that are involved in the making of invisible braces. Proficiency of the Dentist: A dentist who is well known for their skills and good track record are likely to charge higher than other dentists. Number of aligners: Obviously, the number of aligners required to fix the tooth problems directly determines the overall price. Generally, the duration of the invisible braces treatment in Melbourne varies anywhere between 12 and 24 months. Ditch painful metal braces and opt for the more comfortable teeth alignment option that is invisible braces. Contact your dental professional today!